All plaques are hand painted with non-toxic acrylics and roughed up to give an old worn appearance. No Vinyl Lettering! Comes with eight pre-drilled holes and nickel hooks. NOTE: The main picture shown may be prior to hook installation since we ship without the hooks installed. DESIGN NOTE: You may pick different colors and specify names for those which are personalized. Be sure to specify those colors upon check out or they will be painted as shown. For changes to font colors and/or name additions/substractions, please type them in the notes area available during checkout. If nothing is specified we will use our best judgement on color sets. 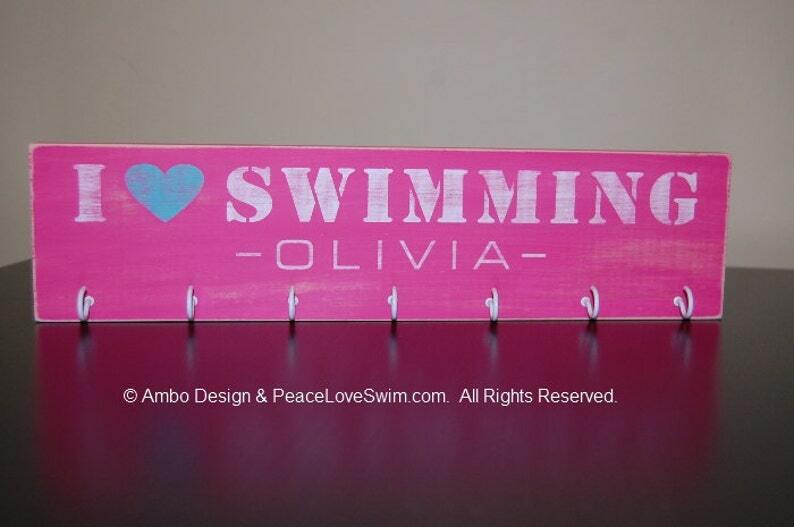 I Love Swimming Ribbon Holder Display with FREE Personalization! I really liked that you could personalize it to fit your look and name.